My silence for the last two days was due to some much-needed unwinding and a little personal maintenance. Now I’m back with a new hair cut, a refreshed state of mind, and a new crop of posts! A couple of weeks ago I received a super-mega discount deal from my old Bikram studio (I got a groupon and went to only two classes. Shame on me!). I decided to make the most of this opportunity and sign up. It’s been a week now and I have really noticed a difference. Not just physically, but with my whole being. This new healthy habit of mine has brought about a new, minor dilemma. I really need to reconsider my workout attire! Before when I had my gym membership, I would throw on any old, baggy shirt and shorts and go. Considering Bikram is a bit more intense (and sweaty!) I need things to wear during and something light and easy to throw on after. 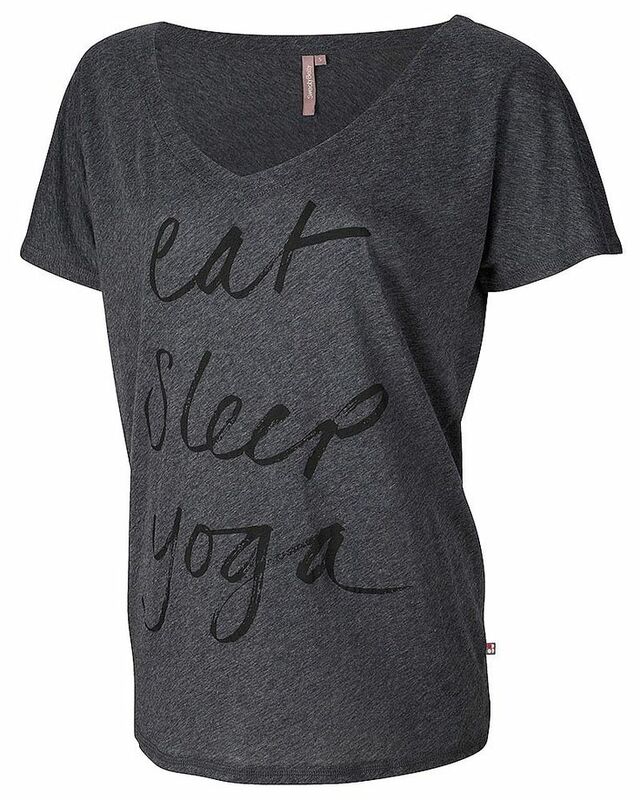 I did a little search and found this very yoga appropriate tee shirt! I’ll admit, it’s a little pricey. You can, however, find good quality workout gear without paying a fortune! This is what I would typically wear to and from my yoga class. This hoody is actually a bright, highlighter pink and is super cozy! As always, I gotta work Hello Kitty into my workout somehow, so I tote her around on my water bottle. As always, my chuck’s take me too and from class in style. (Not pictures: my three, sweaty towels that are very necessary for Bikram). Hoody and Shorts, Target. Duffle bag, Delias. Water bottle, Target. Yoga mat, Cafepress. Sneakers, Converse.